Substance Painter 2018.1.0 – Artist-friendly and powerful 3D painter. Substance Painter is the reference 3D Painting app with never before seen features and workflow improvements to make the creation of textures for 3D assets easier than ever. It is acknowledged as the most innovative and user-friendly Texture Painter out there. Updated Dota 2 Template – The Dota 2 template has been updated to fit with the latest Source Engine 2 changes. Particle Brushes[/u] – Throw water, dirt or even fire at your object and watch the realistic weathering effects unfold in real time! Export to any engine – Export presets for Unity, Unreal Engine 4, Cryengine and Lumberyard as well as Arnold, VRay and many more are incliuded. Material Painting[/u] – Paint full materials at once, lay the groundwork for your textures or paint small details in seconds! Non Destructive Smudge and Clone tools – Get rid of seams on all the textures at once, or use the smudge to create stylized textures easily. Iray path tracing Renderer – Get profesional quality renders of your assets in a few seconds using NVidia’s Iray renderer right in the tool. Smart Material[/u] – Reuse your materials to texture super quickly! Smart Masks – Save mask presets to reuse on future projects. Physically Based Viewport[/u] – Preview your painting in a next-gen viewport for accurate material feedback. Fully Non-Destructive[/u] – Modify your UVs or topology at any time without ever losing your work. Substance Brushes[/u] – Use your Substances as brushes and unleash parametric painting! 2D Seamless Painting[/u] Paint in 2D across seams thanks to the unified 3D/2D pipeline. Massive time saver and unique feature in digital painting application! Multi-Material[/u] – Paint on the different texture sets of your mesh! Shelf[/u] – A dense preset library of materials, tools and effects that are tweakable, making the possibilities infinite. [Main menu] Rename "View" menu as "Window"
[TextureSet] Rename "Bake Textures" button as "Bake Mesh Maps"
Rename "Additional maps" as "Mesh maps"
Next story Microsoft Excel 2016 16.11 – Microsoft’s spreadsheet app. Previous story QuickBooks 17.2.26 – Financial management and accounting for small businesses. 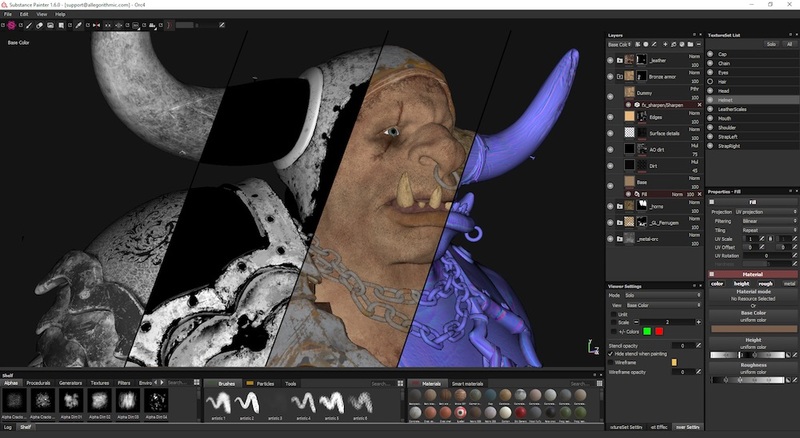 Substance Painter 2.4.1 – Simply the most innovative and user-friendly 3D painter out there. Substance Painter 2018.2 – Artist-friendly and powerful 3D painter.